CARSON, Calif. (AP) — Chargers quarterback Philip Rivers and Cardinals wide receiver Larry Fitzgerald were both part of the NFL’s 2004 draft class and have emerged as the faces of their respective franchises. Rivers has been sacked only 15 times this season, but he will be facing an Arizona defense that is fourth in the league with 33 sacks. The Cardinals are the only team in the league to have multiple sacks in each game they have played this season. Gordon had six receptions for 87 yards last week but this might be a game in which he gets more carries. Arizona has the fourth-worst rush defense in the league and Gordon, sixth in the league with 741 yards, already has three 100-yard games. 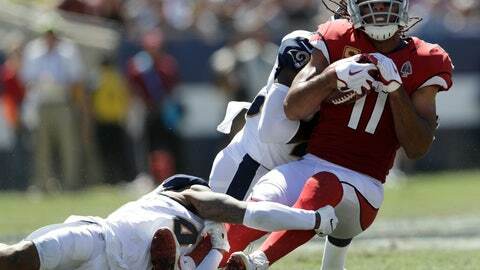 Arizona’s David Johnson has played better in each of the three games since Arizona fired offensive coordinator Mike McCoy and Byron Leftwich was promoted to the job. In last week’s loss to Oakland, Johnson had his first 100-yard rushing game of the season, gaining 137 yards on 25 carries, including a 53-yard run to set up a touchdown. He also had a 57-yard touchdown run called back by a holding penalty. Johnson has had at least 100 yards from scrimmage in each of the three games since Leftwich became coordinator. Los Angeles‘ Michael Badgley, the team’s sixth placekicker since the start of last season, has made all eight field goal attempts, but he missed an extra point last week. That was the Chargers’ sixth missed PAT this season.